U.S. Army Sergeant Anthony Peden, who served two combat tours in Afghanistan and a third in Iraq before returning home and joining an antigovernment militia called FEAR, was sentenced today in Georgia to life in prison for the murder of two teenage sweethearts in December 2011. Tiffany York, 17, and her boyfriend, Michael Roark, 19, were shot and killed in the Georgia woods by Peden and three other soldiers, prosecutors charged, in an attempt to keep secret the militia’s plans to overthrow the government through a campaign of sabotage, bombings and political assassinations. But unlike two of his co-defendants, Pvt. Isaac Aguigui and Pvt. Christopher Salmon, who were sentenced previously to life without the possibility of parole, Peden, 28, could be eligible for parole in 30 years. Baker said the reason Peden received a bit of mercy and the faint hope of distant freedom was because of his combat experience and the obvious damage it did to his heart and soul. According to his lawyer, during Peden’s repeated tours in the mountains of Afghanistan and the sands of Iraq, the soldier suffered between 10 to 15 “severe traumatic brain injuries” and returned home haunted by post-traumatic stress disorder. Peden started the killing in the woods late on the night of Dec. 5, 2011, when he shot York, a high school junior, twice in the head while she was still sitting in the passenger seat of Roark’s car. The couple had been lured there by the militia on the pretext of some nighttime shooting practice. Roark and York sometimes hung out with the group. Roark, who had been discharged from the army just three days earlier, served with the men on the nearby Fort Stewart military base. The group feared that Roark might reveal its plans and decided to silence him. York was essentially collateral damage. After killing York, Peden handed the gun to Salmon, who used it to kill Roark with two bullets to the head. Four soldiers - Peden, Salmon, Aguigui and Pfc. Michael Burnett – were arrested and charged within a week of the murders. Each man faced the death penalty. Burnett quickly confessed and agreed to testify against his former comrades in exchange for a lighter sentence. Aguigui, the ringleader, pleaded guilty last summer and was sentenced to life without the possibility of parole. 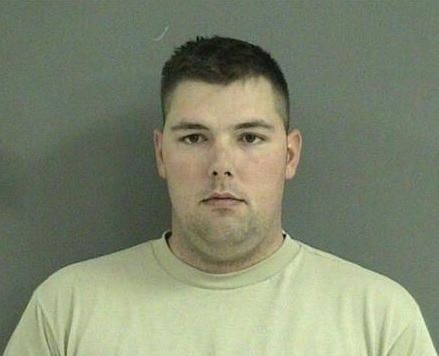 In March, an Army court found him guilty of murdering his wife, Sgt. Deirdre Wetzker, in July 2011. She was seven months pregnant. Investigators determined that Aguigui used the $500,000 proceeds from his wife’s insurance to buy nearly $90,000 worth of military-grand weapons for FEAR – Forever Enduring, Always Ready. One of those weapons was used to kill York and Roark. Peden and Salmon pleaded guilty in April to the killings. Like Aguigui, Salmon was sentenced to life in prison without the possibility of parole. Peden’s sentencing, however, was postponed until today to give his lawyers time to gather and present mitigation evidence, including his history of traumatic brain injuries. Back in the States, Baker said, Peden turned to heroin and other drugs to help him keep his demons at bay. One day on patrol in Afghanistan, Peden and his unit were passing through a village they had been in and out of several times. A local man the soldiers knew and liked and considered to be “a friendly” came out of his home and opened fired on the Americans. Peden and his comrades killed him. Then the man’s son, a boy of about 13, picked up his father’s rifle and started shooting. “Anthony had to kill him,” Baker said. “There are several other horrible stories about what happened to Anthony that have just caused severe PTSD.